By Savaughn Vasconcelos, Sarah Hirschorn, and Jody Goldenberg (Contributors). In the melting pot of Sharon High, students of all backgrounds and interests connect with one hobby: music. While music is common throughout, the specific genres and types of music vary widely within the student population. The results of a recent survey administered to 128 students, including 29 freshmen, 35 juniors, 28 sophomores, and 32 seniors, revealed just how varied music preferences are here at SHS. As follows, the most popular genres were pop (35%), alternative (17%), hip-hop (13%), rock (11%), R&B (12%), acoustic (5%), country (6%), and classical (2%). “It makes sense that pop music is the most popular type of music because it’s the music [high schoolers] always hear on the radio,” said freshman Blaize Hanna, who says she likes the genre best herself. Thirty-eight percent of freshmen typically listen to pop music; 45 percent of freshman females and 14 percent of freshman males like the genre best. “I’m not surprised that pop is the most preferred because it’s music that’s always on the radio. People listen to it because of it’s catchy tune and lyrics that can relate to everyone,” he said. Freshman Nicole Teven says pop is tailored for our age, so it makes sense that kids like it. But Teven, who prefers to listen to a mix of rap (R&B) and pop, says she is bewildered at how few freshmen reported an appreciation for R&B. “I know a lot of people who listen to it. It might not be their favorite but [R&B] is still popular, so that’s surprising,” she said. Results of the survey also reveal the wide range of apps SHS students use to find and stream music. An overwhelming majority of sophomores (78% of females and 80% of males) use Spotify more than any other music app. Fine says Spotify’s unique features sets it apart. “I like Spotify because you are able to listen to other people’s playlist, which other apps don’t allow you to do,” said Fine. Kantor says he likes Spotify because of the wide variety of music available. “Every Friday they release new music and it allows me to see all the new songs and albums from famous and upcoming artists,” said Kantor. For sophomores at Sharon High, iTunes is the least popular app for listening to music. Only 4 percent of sophomores chose it as their favorite. The junior class reported the greatest variety in their genre preferences. The junior females’ list of favorites included pop, alternative, R&B, and rock. Meanwhile the males love hip hop, pop, rock, R&B, and acoustic. Junior Jalen Kountze says he doesn’t listen to the radio, even in the car. “I don’t listen to the radio because they play the same songs on repeat,” he said. Some seniors, however, still have fun tuning in to their favorite stations. Senior Rosalie Barkley, whose go-to is Kiss 108, says she is a big music lover and loves everything from Broadway musical numbers to rock-and-roll. Senior Chinda Eleonu is another music fan who listens to an extremely diverse range of music on a daily basis. He loves it all— from One Direction to Lil Yachty. Eleonu said, like Barkley, he usually goes to at least two concerts during the school year. “This year I had the pleasure of attending Big Sean and Lil Uzi,” he said. The survey also assessed what time of day students choose to listen to music. Teven says she mainly listens during her free time because she cannot multitask. “Whenever I’m trying to think and study when I’m listening to music it will just distract me and I’ll want to sing to the music. I’ll just get totally off track,” she said. However, Hanna says she listens to music while preparing for tests. “I think [music] helps people study because they can concentrate more easily. When you are listening to music you aren’t hearing any outside noise,” she said. She not the only one who feels this way. 70 percent of freshmen, and 72 percent of all surveyed students, reported listening to music while studying. 100 percent of all freshmen said teachers should permit earbuds in the classroom. According to Gray, he and many friends plug in while studying because “it’s entertaining” and prevents boredom. He adds that he strongly supports the case for more music usage in school. “People [are] focused when they listen to music in school. It depends on the person, but it should be a choice… Everyone like to have a choice,” he said. Sophomore Ethan Kantor says that listening to music helps students relax. “For some, music is a therapeutic method to help release stress. 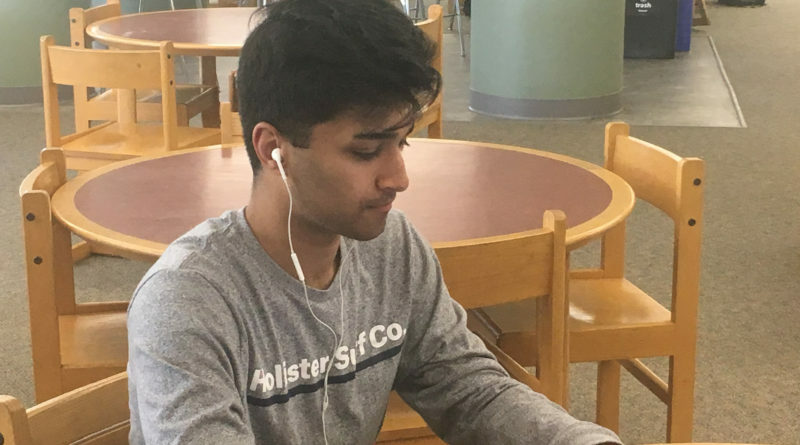 When I listen to music it helps me relax when I’m feeling stressed out,” said Kantor, though he adds that teachers should be careful to prevent students from abusing the privilege. Sophomore Abby Fine says she agrees. “A lot of kids listen to music to concentrate and focus, so if students were allowed to listen to music more often during the school day they would do better on work and assignments,” she said.